A faceted amethyst teardrop is wire wrapped into a sterling silver cable chain. Stone measures approximately 1/2" high. Contact Us for rush orders. You can visit our Options page or check out our FAQs for answers to many common questions. Still need assistance? 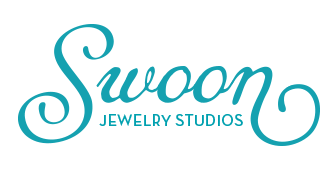 Call 385-355-1070 or email hello (at) swoonjewelrystudios.com and we'll be happy to help!